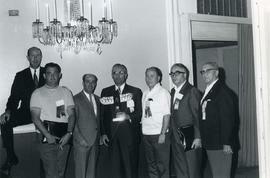 Photograph depicts Alec Jackson and others posing with a newly received award at a convention in San Francisco in 1969. Oral history interview with Adele Zucker who grew up in Colorado, worked for B’nai B’rith Women and the U.S. Department of Agriculture as an administrator and training officer for secretaries in California and than Washington. Ann and Miriam in L.A. Photograph depicts Ann and Miriam posing in front of a boat in Los Angeles. Photograph depicts Ann and Miriam on Olvera Street in Los Angeles. 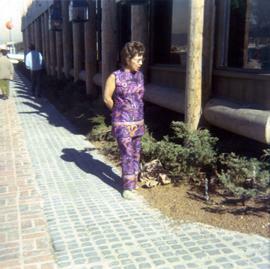 Photograph depicts Ann posing in front of a restaurant on Olvera Street in Los Angeles. Photograph depicts Ann walking down Olvera Street in Los Angeles. Photograph depicts Ann and an unidentified woman standing in front of a popcorn stand on Olvera Street, Los Angeles.